Whether you're new to the Battledome or new to the in-Depth Battlepedia, the amount of information that is given can quickly become overwhelming and quite confusing if you don't know what you're looking at. We've separated the in-Depth View of the weapon by color so that it is easier to tell what everything is. Click on the color of your choice below and it will take you to the relevant part of the article. The name of the weapon you are viewing is always at the top left corner. Beside it, it's rarity is displayed so that you know how difficult it may be to obtain the weapon. Click Here for a guide that explains the different rarities available. Under the name is the weapon's description. The description is a blurb that usually contains a little more information about where the weapon comes from. To the far right, you can see a plushie fish negg. Click on him and he sends you to the weapons Item Database Profile where you can get more information about the weapon. This section displays a weapons attack. An attack is dealt in icons. In the example above you can see that there is a little "+" sign. This means that the weapon deals variable attacks. These attacks are usually fractional which means that they don't deal full icons. The statistics in the notes section contain more information about these fractional icons. For a full attacking guide Click Here. Defense works similarly to attacking. The number of icons displayed is an indicator of how much you are defending. The icons are displayed with a red circle and a line across them to show that they are being stopped. Calculating how much damage you are actually defending is a more complex ordeal as you have to include strength boosts and defense boosts. Our Defense Guide explains this in much more detail. Defense can also be clocked as a percentage. 100% defense will block all of that specific type of icons whereas 50% defense will stop half of the icons dealt. Reflection takes icons that were dealt to you and sends them back towards your opponent. Reflection is typically dealt with in percentages but some items do reflect individual icons. The icons are the same as the defense icons which can lead to confusion sometimes. Click Here for our guide on reflection. The effects section contains a lot of information about different things weapons can do. A indicates that the weapon has the capability of freezing the opponent. The percentage that follows the icon indicates what it's chances of freezing are. Click Here for our guide on freezing. The icon denotes that the weapon has healing properties. The icon is followed by either a number which represents the number of hitpoints you recover or a percentage. The percentage represents how much of your full hitpoints you are going to recover. If the weapon does not heal all the time, it will be denoted by a percentage chance, this represents how likely the item is going to heal you. Click Here for our guide on healing. The indicates that the weapon will give you an item that you can then utilize in the battledome. The icon indicates that the weapon can poison your opponent. The icon is usually followed by the name of the disease the weapon can give. The icon indicates that the item transforms into another item that has a different effect when used in the battledome. The restocks at section indicates where the weapon can be obtained. Most of the time, weapons restock in stores but some weapons can be obtained through quests, special events, plots and more. The used by section has links to challengers who use the weapon in the 1 player battledome. The actual icons section contains a lot of important information about weapons. Attack Icons, followed by a number indicates how many of that specific icon is dealt. If there is a range (0.9-9) that indicates that 0.9 to 9 icons can be dealt. Fractional icons work in decimal increments, all icon values dealt are in between those two numbers though. Defense icons work the same way as attack icons, the only difference is when a percentage blocker defends, the number next to the icon is displayed as a percentage. Since reflection was not given it's own icon in the battledome. It is denoted with a minus sign "-" in front of it's numerical value. Everytime you see a number with a "-" that's not a range, it is a reflected icon. If reflection does have a range, it is denoted by a "- -" between the numbers (-1 - -4). Healing is also part of the actual icons section now. Like in the effects section, healing is indicated by either a number which indicates the number of hitpoints healed or by a percentage which indicates the percentage of your total hitpoints that you are healing. The section on the right contains the image of the weapon. Below that is the weapons usage. Some weapons can be used multiple times in a battle, some can only be used one per battle. Others can break permanently or break just for the battle. Click Here for our guide on weapon reliability and usability. Below the weapons reliability, if a weapon is species specific, a species name is shown. Whatever species name is shown, only that particular neopets species can use the weapon. 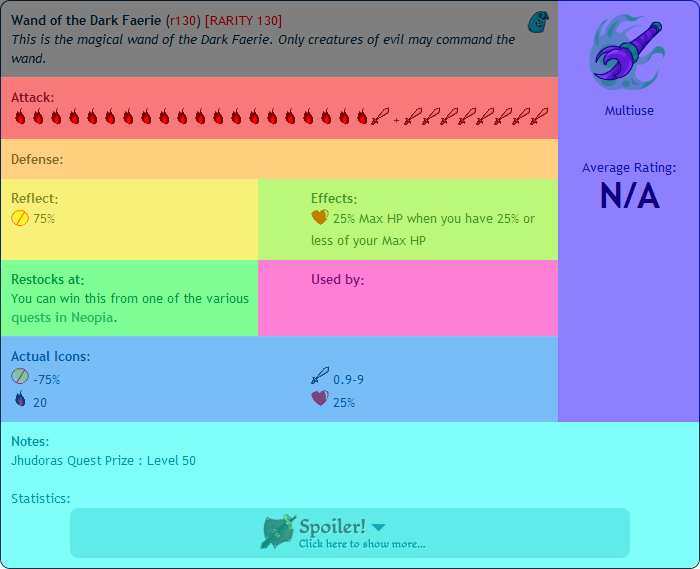 If the area is blank (like the example) all neopets can use it. The average rating is the average score all the raters have given the weapon. The higher the score, the better the weapon is. The notes section contains any additional information that isnt covered elsewhere. A indicates that you can only have one of this item or item type. Freezers, healers and stealing weapons are generally limited to one of each. Fractional and variable healing weapons have a statistics section in the notes. If you click on the big spoiler button, it expands and displays hit probabilities. This is for the more advanced battlers who want to know exactly what the probabilities of fractional icon hits are. This page was last updated on September 2, 2012.